Strong-super El Nino conditions persist in the Pacific – and will remain that way – over the coming weeks. 850mb zonal wind anomalies are currently suggestive of more east-based forcing, as the tropical forcing pattern is once again temporarily disrupted by the development of an amplified/coherent MJO wave. This wave is forcing changes in the mid-latitude/polar jet and will result in a Southeast Asian trough and a concomitant downstream ridge over the mid-latitudes of the central-west Pacific. The development of a suppressed tropospheric Aleutian ridge is more consistent with intra-seasonal MJO forcing in La Nina’s; however, I don’t anticipate the MJO will remain coherent for a protracted period. Most model guidance prognosticates an eventual weakening of the phase 4/5 wave in a couple weeks, as 850mb zonal wind anomalies contemporaneously shift westward, retrogressing to their mean position for this El Nino. This should – in turn – cause the upper divergence cell and concomitant convection to return to the central tropical Pacific by the third/fourth weeks of December. The expected responses to the tropospheric precursors have initiated over the past week, and are forecast to gradually become more apparent by mid-December. Specifically, the last post outlined the potential for the developing 500mb tropospheric regime to initiate wave-1 EP flux, with lower levels of wave-2 EP flux. The enhanced wave-1 is being detected in stratospheric guidance as we will see increased perturbation of the stratospheric vortex over the next week. However, the peak correlation with precursor patterns is generally 3 weeks later, and so, I continue to expect the most potent burst of wave activity flux to occur near the end of December/early January. The tropospheric pattern over the next 7-10 days continues to favor wave-1 activity, and this will be further enhanced by the development of a transient east based –NAO feature in the Atlantic. The European high heights will also aid in increased wave-2 flux as we head into mid/late December, further disturbing the vortex. Geopotential / heat flux values should spike within 1 standard deviation of the mean in mid-December, but a more significant spike should occur toward the end of the month. However, as noted before, the primary obstacle to a favorable December pattern was the strong westerly QBO signal which retards poleward ozone transport and stratospheric Aleutian high develop. With that being said, the competing forces are such that the tropospheric conditions strongly favor enhanced energy transfer into the stratosphere, and consequently, an eventual weakening, likely displacement, of the stratospheric polar vortex in January. Looking at prior years, the forecasted stratospheric evolution looks to be running ahead of the 1957-58 vortex split timing (which officially occurred January 30th, 1958), behind early January split/displacements, and roughly the same as the 1986-87 displacement timing (which officially occurred the third week of January). The tropospheric pattern began changing before the official date of displacement or split, however. The NAM shifted predominantly negative by the beginning of January in 1987 (3 weeks before official displacement), negative by early January 1958 (3 weeks before official split), and negative by February 1st 2007 (3 weeks before official displacement February 24th, 2007). Most events had tropospheric blocking in progress before the official date. The real key is not when the official displacement occurs, but the timing of significant stratospheric vortex / geopotential height / temperature shifts, which occur 1-3 weeks before the official event. 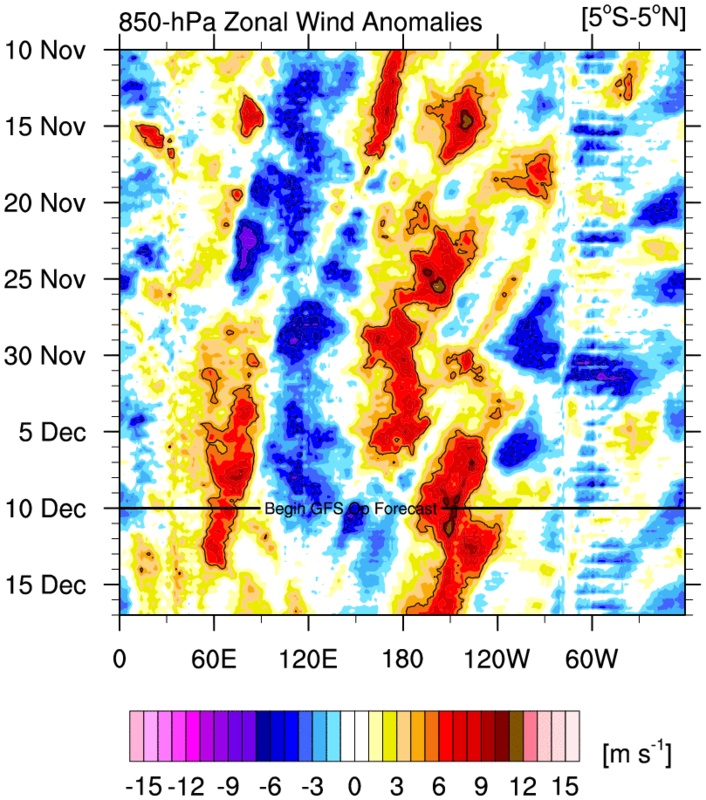 Thus, I anticipate that the increased wave-1/wave-2 flux will continue to gradually increase over the next few weeks. The maximum of wave activity flux anomalies should occur between the end of December and the first 10 days of January, effectively forcing the stratospheric vortex off of the pole by the middle of January. Model data is beginning to detect the progression of this possible displacement event. CFS V2 weeklies for 10hpa suggest that higher than normal geopotential heights shift across the Pacific/Asian side of the pole by the first week of January. I expect that progression to continue, such that the 10hpa stratospheric vortex is displaced southward into Europe by mid January (I favor an “official” date around January 20th +/- 5 days). Consequently, I anticipate that the stratospheric changes will fairly rapidly be realized in the troposphere, such that mid-level heights rise over the Arctic in the first week of January. The strong ridge over the Eastern US should propagate slowly poleward into Canada as the Alaskan vortex gradually retrogrades westward. Higher than normal heights should develop – particularly across the Pacific side of the pole – by early January. Thus, I anticipate a neutralization and reversal into a predominant negative modality of the northern annular mode in early January. The stratospheric vortex may remain near Greenland for 7-10 days thereafter as the potential displacement event progresses. Therefore, my best guess is that the NAO may not fully respond into a protracted negative state until the middle of January, following the AO. As noted in the winter outlook, numerous tropospheric, boundary layer indicators were suggestive of a mean –NAO/AO modality for the DJF period. Nothing has changed on this front. I am still very confident that the reversal will occur due to the number of indicators suggestive of the same outcome. I would not be surprised to see a strongly negative AO/NAO period for at least 2-4 weeks in the mid to latter part of winter (most likely centered on the month of February). The tropospheric weather pattern will continue to remain largely unfavorable for meaningful snow events in the coastal Northeast. The tropical forcing / MJO induced –PNA coupled with the positive AO in the means will maintain a SE-ridge, thereby making it very difficult to achieve significant snowfall. There will be a transient east based –NAO block / Scandinavian block in the December 16th-21st period. It’s possible that something minor/moderate occurs, though I wouldn’t forecast it at this time. Unfortunately, outside of the interior Northeast, it appears that the probability of a white Christmas is lower than normal this year due to the overall pattern. Of course, no guarantees can be made (there’s always a chance we get lucky with timing) but the pattern will be unsupportive of significant, 4”+ snow events through the end of December. Early January should feature significant changes. Higher than normal heights should begin to develop across the pole, while concurrently, the positive geopotential height anomaly over the East shifts poleward into Canada. The neutralization and reversal of the NAM in early January should promote a much more seasonable pattern in the Eastern US. Recall that January was always predicted to be a near normal month temperature wise. The beginning of the month may start off quite warm. However, the pattern in the troposphere should rapidly improve through the first and second weeks. The sub-tropical jet should be more noticeable as storminess is permitted to undercut the ridge w/ the poleward propagation of positive geopotential heights. In closing, everything appears to be largely on track. The month of January should be much closer to seasonable levels in the coastal Northeast, and coupled with a more active STJ, the potential will increase for wintry precipitation by early January. The “peak” of wintry weather relative to normal continues to look like the month of February. I don’t see any evidence at this point to suggest that winter should be “cancelled”, or that the original winter outlook won’t pan out.